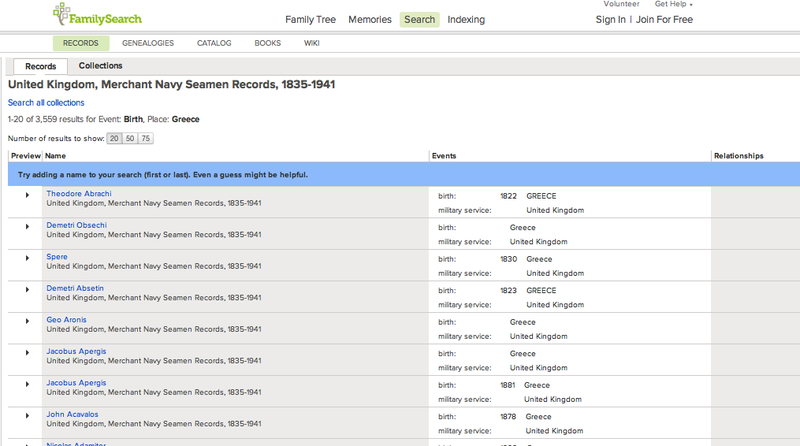 The FamilySearch.org website offers FREE access to their database - UNITED KINGDOM, MERCHANT NAVY SEAMEN RECORDS, 1835-1941 . There are 3,559 people in the database who have listed Greece as their place of birth. An act of Parliament required agreements and crew lists to be filed with the Register Office of Merchant Seamen to create a means of manning the Royal Navy in wartime. Registration of merchant seamen was provided for in the 1835 Merchant Shipping Act. Seamen were engaged by the voyage at this period, and there was no permanent merchant service. The registers were made up from the new returns of agreements and crew lists for each voyage. In 1857 the use of seamen’s registers was discontinued. This collection includes records for the years 1835 to 1857. Multiple columns by year in order to record out voyages and return voyages. A ship number was used to indicate which ship the seaman sailed on. Under each year column there are two columns, one for outbound voyages and one for return home voyages. The date and ship are entered into the columns for each voyage taken.